The Mary Poppins books, written by P.
L. Travers (Pamela Lyndon Travers) and the first published in 1934, were some of my favorites when I was a little girl. I read them time after time and enjoyed them tremendously. I wanted to have a nanny just like her! She was so no nonsense on the outside but, oh my, what wonderful adventures she had with the Banks children and all those great characters who surrounded her. Recently, when I was in New York, I had a delighful time at the wonderful "The ABC of It" exhibition at the New York Public Library and was thrilled to see P.L. Traver's parrot-head umbrella, exactly like the one that Mary Poppins uses, as well as some of the original illustrations for the books by Mary Shepard and a doll that served as a model for that perfect nanny. I think that this rainy afternoon will be a good time to read one of those books again! Los libros de Mary Poppins, escritos por P. L. Travers (Pamela Lyndon Travers) y el primero publicado en 1934, fueron algunos de mis favoritos cuando era una niña. Los leí vez tras vez y los disfruté enormemente. ¡Yo quería tener una nana igual que ella! Era aparentemente muy seria pero, ¡ay!, qué aventuras tan maravillosas tuvo con los niños Banks y todos los otros personajes maravillosos que la rodeaban. Hace poco, estuve en Nueva York y pasé un rato maravilloso en la exposición "The ABC of It" en la biblioteca pública de esa ciudad. 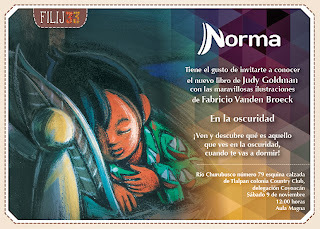 Ahí vi el paraguas con cabeza de loro de la autora y que es igual a la que usaba Mary Poppins asi como algunas de las ilustraciones originales de los libros hechas por Mary Shepard y una muñeca que sirvió como modelo de la nana perfecta. ¡Creo que esta tarde lluviosa será perfecta para leer uno de esos libros de nuevo! Acabo de regresar de Nueva York y tuve la oportunidad de ver la maravillosa exposición de libros para niños en la NY Public Library. Me encantó especialmente porque yo lei muchos de los libros que están ahí y siguen siendo de mis favoritos. Si tienen oportunidad de hacerlo, vayan a verla porque, además de los libros, la forma en que todo está expuesto es fascinante. Luego subo más fotos pero, mientras tanto, les mando esta, donde estoy en medio de la silhueta de Max de Where the Wild Things Are y que, del otro lado, está forrado de peluche. También están libros como los de Mary Poppins (además del paraguas con cabeza de loro de P.L. Travers), The Secret Garden, The Phantom Tollbooth, comics, libros antiguos, una selección de libros prohibidos (en Estados Unidos) y un gran etcétera. Bien vale la pena pasar dos o tres horas ahí, rodeados de color, letras y buenos amigos. I just got back from New York and had the chance to see the marvelous exhibit of children's books at the NY Public Library. I also loved the fact that I saw many of the books that I read as a child and which continue to be favorites to this day. If you have the chance to, go and visit it because, besides seeing the books, the way they are exhibiteid is fascinating. 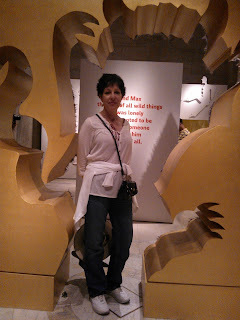 I'll upload some more photos later on but, in the meantime, here I am standing inside the silhouette of Max, from Where the WIld Things Are and which, on the other side, is covered in fake fur. There are also books like Mary Poppins (plus P.L. Traver's parrot-headed umbrella), The Secret Garden, The Phantom Tollbooth, comics, antique books, a selection of banned books (in the US), and a huge etcetera. It's well worth it to spend two or three hours there, surrounded by colors, letters, and good friends. Starred review by Kirkus for Whiskers, Tails and WIngs!/¡Muy buena reseña de Kirkus de Whiskers, Tails and Wings! I'm thrilled that Kirkus gave my book a starred review! ¡Me da mucho gusto que Kirkus le otorgó una estrella a mi libro! Five animated, traditional tales are enhanced by ethnographic information about the indigenous peoples who still tell these stories. The author has selected tales not from the well-known Aztec or Mayan tradition, but from the Tarahumara, Seri, Huichol, Triqui and Tseltal peoples. Each short tale is followed by a description of the group’s traditional customs and their contemporary lives, including their use of cars and computers (and, in the Huichol chapter, ceremonial peyote by chosen adults). The stories attest to the ingenuity of the cricket, Señor Grillo, over the force of Señor Puma’s army and to the steadfastness of Mosni, the sea turtle, whose journey to bring sand from the ocean floor enabled Hant Caai, the Seri god of creation, to create land that humans would inhabit. The Huichol story explains why the opossum has a bare but prehensile tail. The humorous Triqui tale describes insects invented by their god of creation to make Man and Woman do some real work, and the last story recounts the scary encounter between a large buzzard and a small frog. The book is handsomely designed, with full-bleed acrylic-and-watercolor paintings on heavily textured papers starting off each story. Realistic vignettes emphasizing folk art and intricate clothing illustrate the informational sections. Comprehensive glossaries (with pronunciation guides) accompany each story, and a scholarly bibliography and index round out the volume. ¡Estaré en la conferencia de la American Library Association en Chicago!/I'll be at the American Library Association in Chicago! Attending the ALA Annual Conference this month? You are invited to attend "Cuentame un Cuentito," a cross border look at Spanish children's books from Mexico and the U.S. The panel will be part of the REFORMA program on Saturday, June 29th. 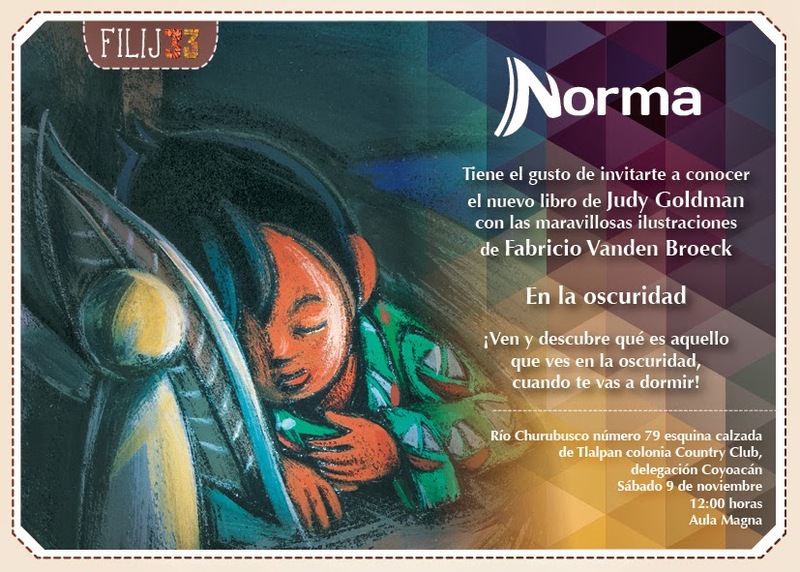 Judy Goldman, children’s author from Mexico who has published a number of books in both Mexico and the U.S.
René Saldaña, Jr, children's and YA author and associate professor of language and literacy at Texas Tech University. Tim Wadham, Director of the Puyallup Public Library and author of School Library Journal column “Libro por Libro." Pam Fochtman, President of Lorito Books, will moderate. The panel will discuss how authors create stories that inspire and how to identify the materials that engage young Latinos. It will look at children's and young adult materials published on both sides of the border and contrast the type of books published for Latinos in the US with Spanish children's materials in Mexico. In light of the recent articles in The New York Times and Publishing Perspectives, this panel should be informative and thought-provoking. Hoy Maurice Sendak hubiera complido 85 años. En mi opinión, fue uno de los grandes de la literatura infantil y juvenil pues escribía e ilustraba, an algunos casos, sin miramientos y si colorear todo de rosa. Por eso, sus libros siguen gustando a legiones de niños que los descubren por primera vez o que los siguen leyendo años después con tanto gusto. Sus personajes, como Max y los monstruos, los llevas siempre en el corazón. En los libreros de mi casa hay varios de sus títulos y, aparte de Donde viven los monstruos, uno de mis favoritos, también están Swinelake, Mummy?, un libro pop-up de Arthur Yorinks, y otros pero los que más cuido son dos que ya casi no se encuentran porque fueron de los primeros que el ilustró. 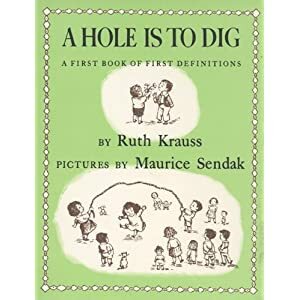 Fueron escritos por Ruth Krauss: A Hole is to Dig y Open House for Butterflies. Los dos recogen divertidas definiciones hechas por niños en edad preescolar y son un deleite. Tuve la suerte de comprarlos usados hace varios años y me di cuenta, después, que son primeras ediciones. Son unos de mis tesoros aunque no están en óptimas condiciones. Eso no me importa porque me parece que los niños que los leyeron lo han de haber hecho tantas veces que los dejaron así. Libros así son libros amados. Hoy no nos queda más que agradecer la vida y la imaginación y talento de este hombre. Today Maurice Sendak would have celebrated his 85th birthday. In my opinion, he was one of the greats in kid's lit because he wrote and illustrated, in some cases, without being oversweet or producing literature that saw everything through rose-colored glasses. I believe this is why his books are still being enjoyed by legions of kids who discover them for the first time or are still reading them years later with so much pleasure. His characters, like Max and the wild things, will always be in our hearts. My bookshelves are home to many of his books and, besides Where the Wild Things Are, you'll also find Swinelake, Mummy?, written by Arhtur Yorinks; and others but the ones I take care of the most are two written by Ruth Krauss and illustrated by him: A Hole is to Dig and Open House for Butterflies. Both have definitions made by preschoolers and are delighful. I had the good luck of buying them used a few years ago and later found out that they're first editions. They're treasured though they're not in excellent condition. That doesn't bother me since the kids who read them must have done it so many times that they left them like that. Books like those are loved. Today we can but thank Sendak for his life, imagination, and talent. Yo soy fan de la fantasía y no me da pena decirlo. Crecí con los libros de Narnia y Mary Poppins, devoré los libros de Harry Potter y amé la serie de Philip Pullman que empieza con Las luces del Norte. Ojalá la trajeran a México, donde hay muchos fans como yo. Yo sería la primera en la fila para entrar. I'm a big fan of fantasy and I'm not ashamed to admit it. I grew up with the Narnia books and Mary Poppins, I devored the Harry Potter books, and loved Philip Pullman's His Dark Materials trilogy which begins with The Golden Compass. Hopefully, they'll bring it to Mexico, where there are a lot of fans like me. I'd be the first in line to see it. ¡Me da mucho gusto anunciar que tengo un nuevo blog para niños! Por favor visítenlo en www.judygoldman4kids.blogpsot.com . I'm very pleased to announce that I have a new blog for kids! Please visit it a www.judygoldman4kids.blogspot.com .